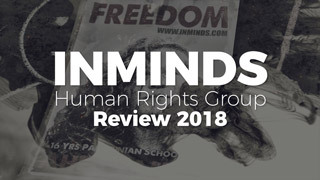 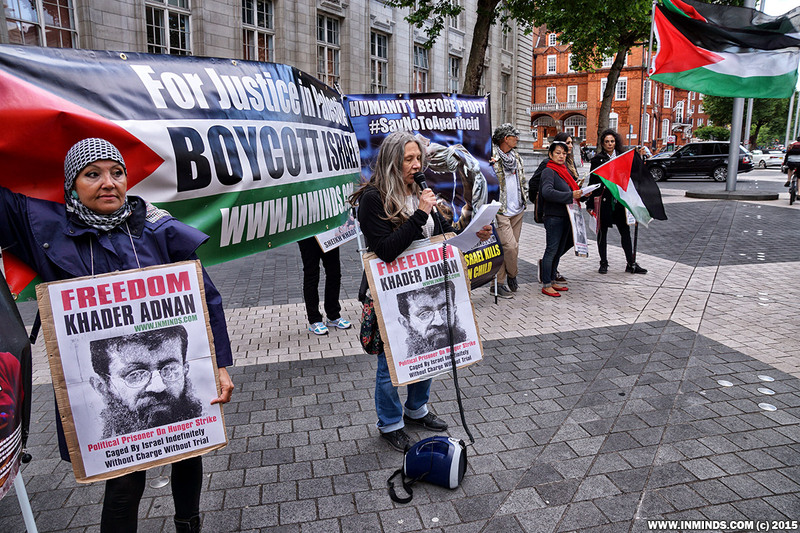 An emergency protest to demand freedom for Palestinian hunger striker Sheikh Khader Adnan was organised by Inminds on 9th June 2015 at the reception of the Israeli deputy ambassador at the Goethe Institut in London where the Israeli government sponsored film festival Seret 2015 was being launched. 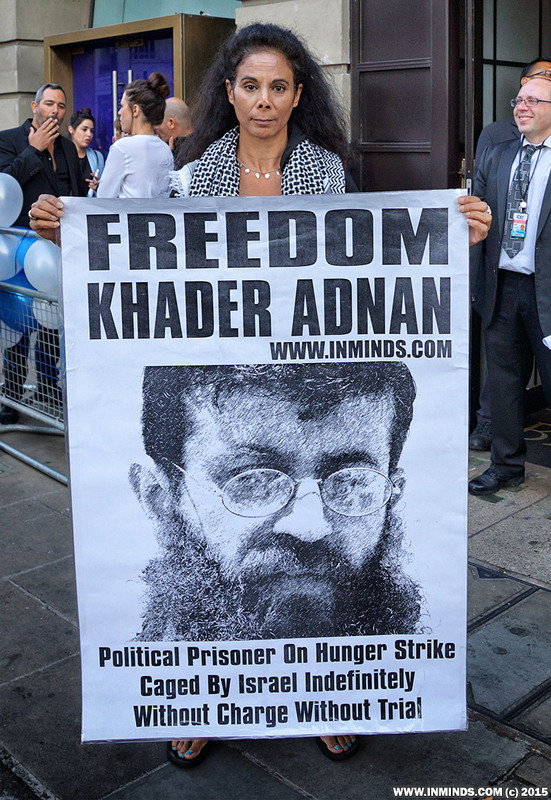 After 36 days on open hunger strike, Khader Adnan is in critical condition, experiencing intermittent comas, a sharp decrease in weight and drop in his heart rate. 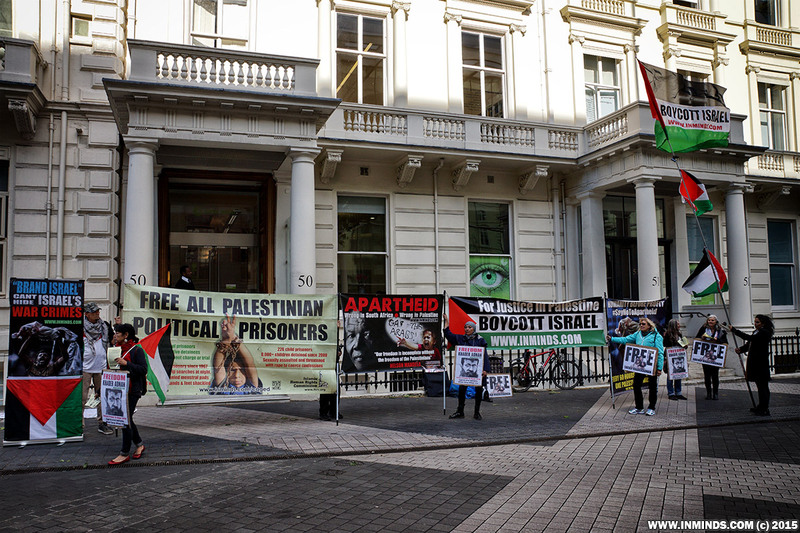 To mark the 50th anniversary of Israel-German relations Eitan Na'eh, Israel's Deputy Ambassador in London, and Tania Freiin von Uslar-Gleichen, Germany's Deputy Ambassador in London, were hosting a reception at the Goethe Institut to kick off the Israeli government sponsored SERET 2015 London Israeli Film Festival with an exclusive preview of the film Farewell Herr Schwarz. 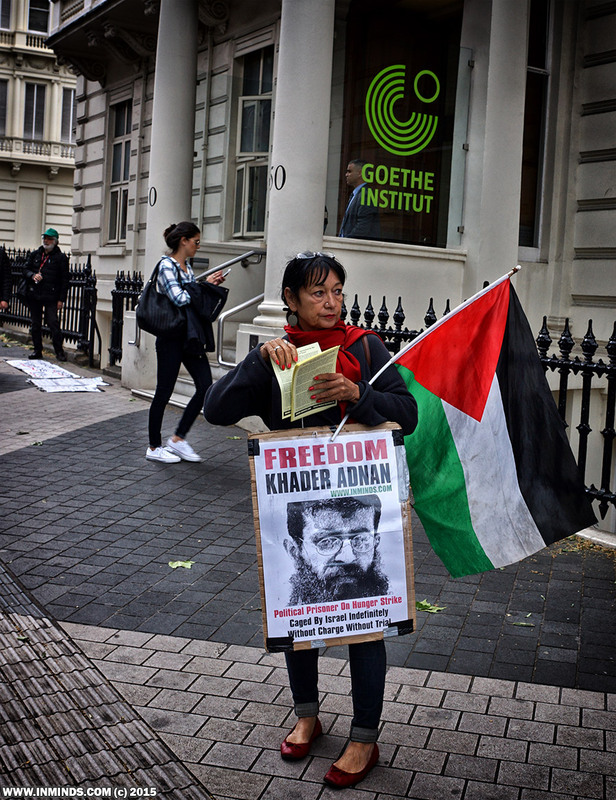 When Tania Freiin von Uslar-Gleichen, Germany's Deputy Ambassador, arrived at the Goethe Institut she was greeted with a protest demanding freedom for Sheikh Khader Adnan and for Germany to stop its 50 years collaboration with an apartheid regime including its sponsorship of the apartheid funded film festival. 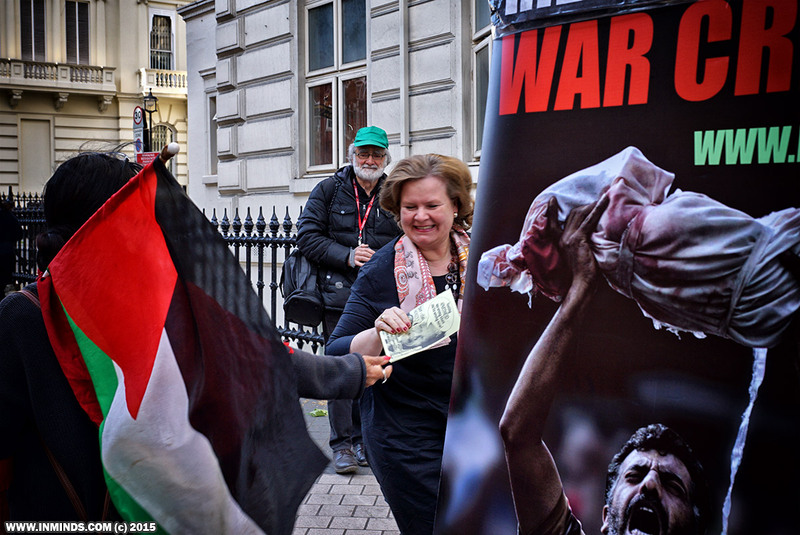 Whilst she didn't engage with the activists outside to discuss what the issues were, to her credit she did take a leaflet. 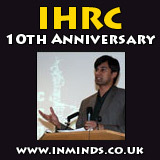 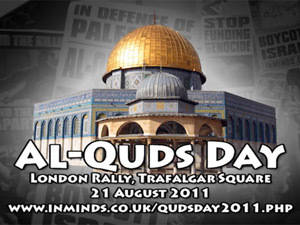 The London public were very sympathetic around 500 leaflets were taken a short period of time. 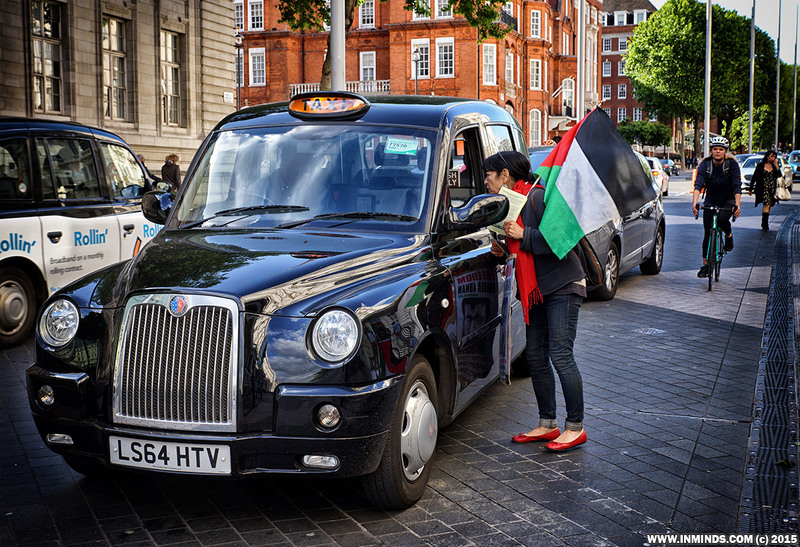 Taxis and cyclists stopped to ask questions and learn more about administrative detention, Khader Adnan and Germany's collaboration with Israel. 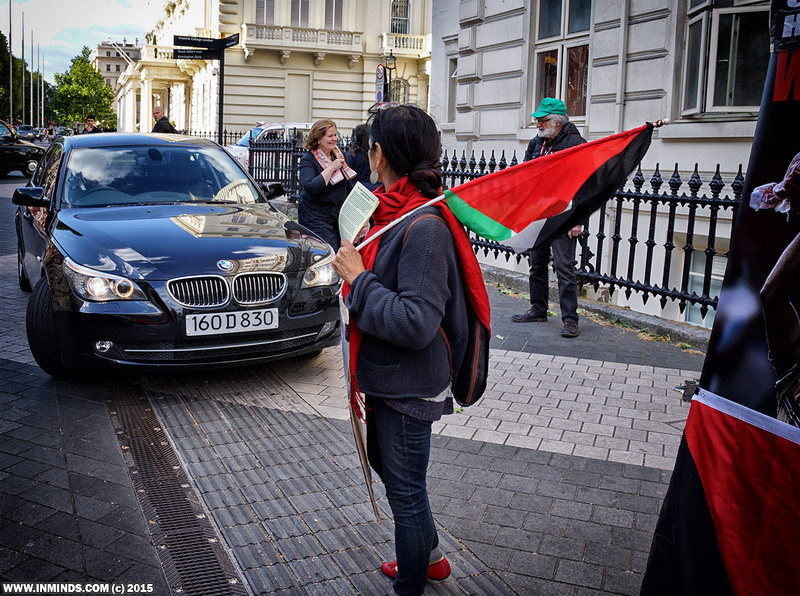 Cars hooted in solidarity with the protest. 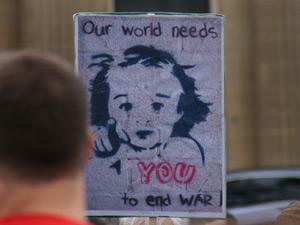 All in all it was a very successful protest. 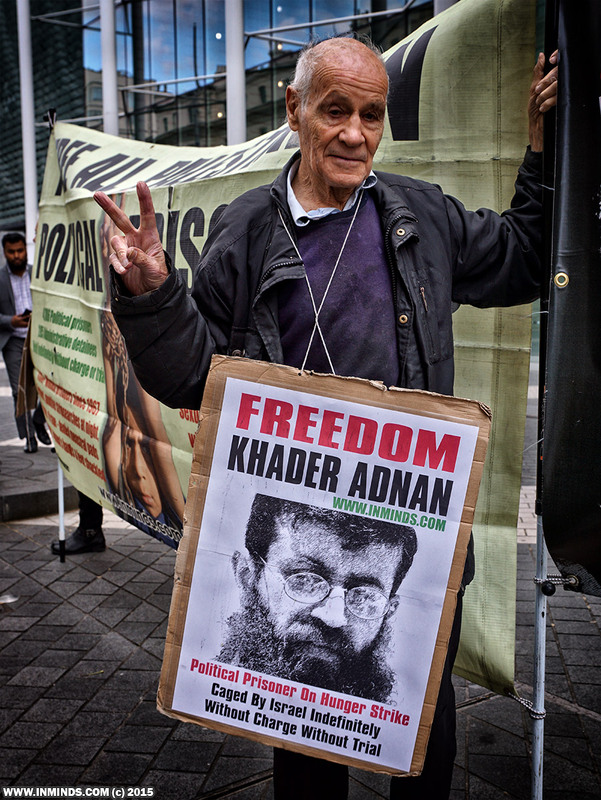 We are here today to demand freedom for Palestinian political prisoner Khader Adnan who is caged in an Israeli dungeon without charge and without trail. 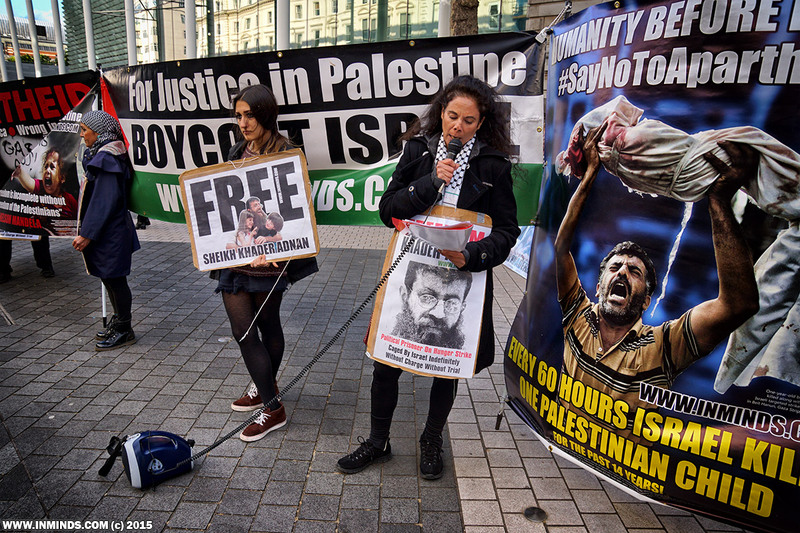 Today marks his 35th day of hunger strike. 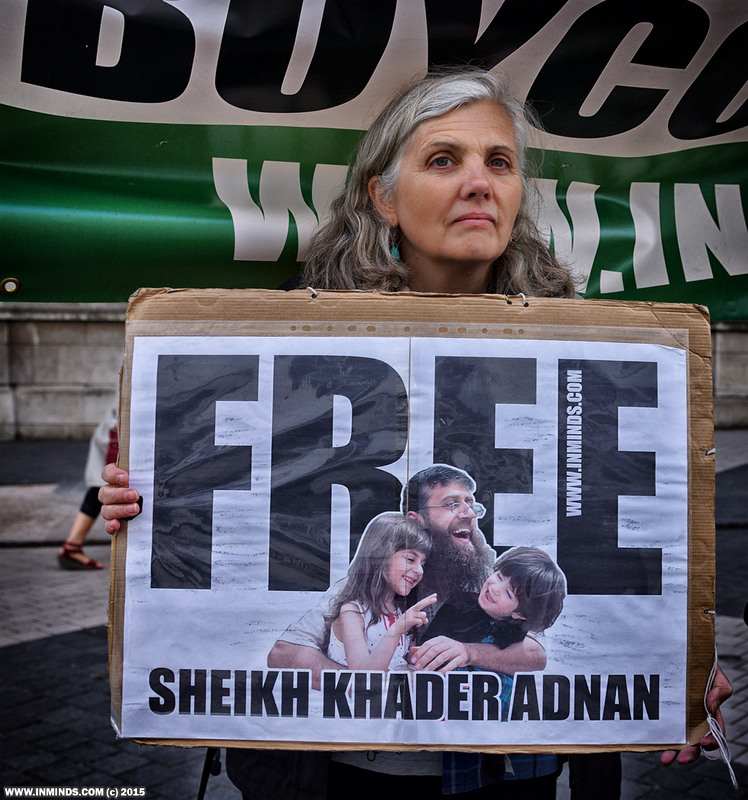 His condition is critical, he is experiencing intermittent comas, a sharp decrease in weight and drop in his heart rate. 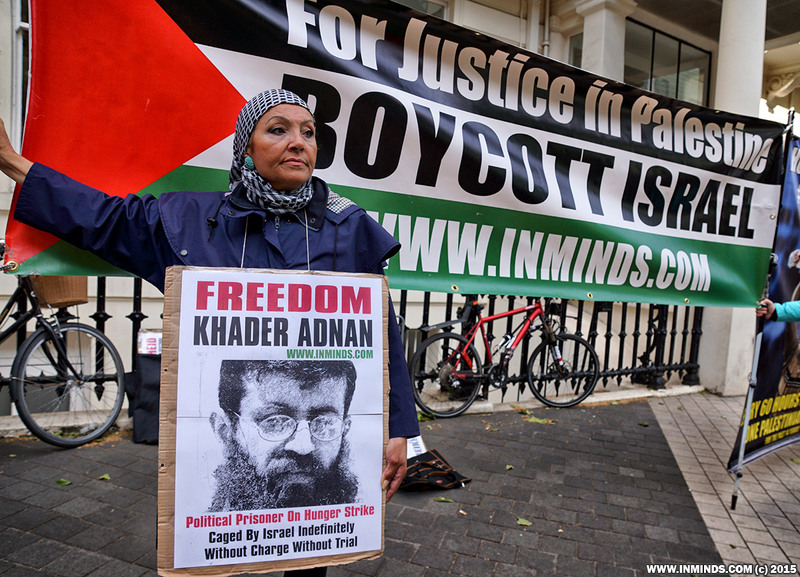 Sheikh Khader Adnan is known as the father of the hunger strike - the symbol of Palestinian resistance and steadfastness. 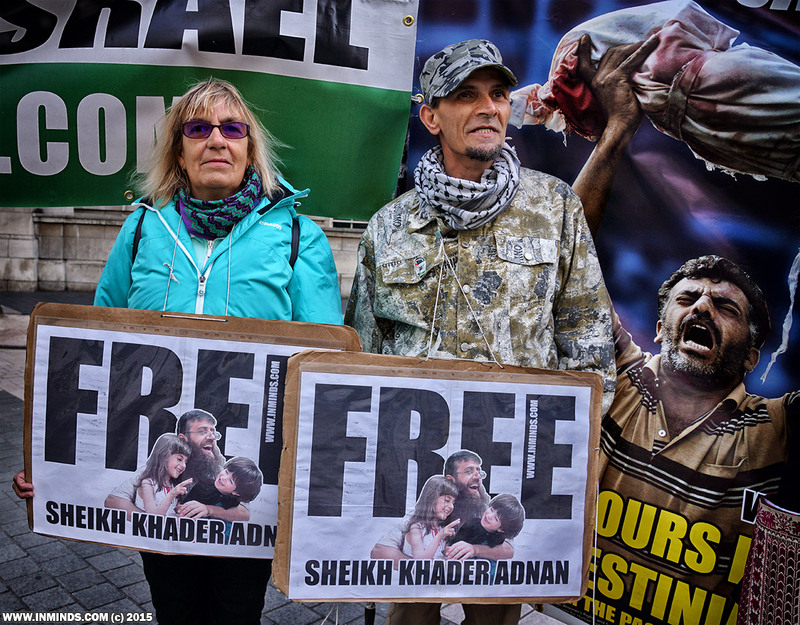 In 2011 he was abducted and caged indefinitely without any charged or trial under Israeli illegal system of punitive administrative detention. 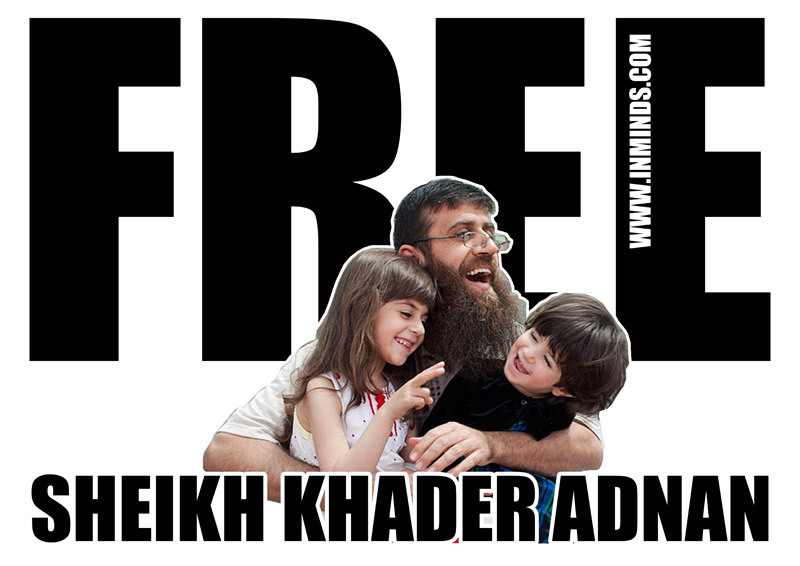 To protest his illegal imprisonment he went on hunger strike and won his freedom. 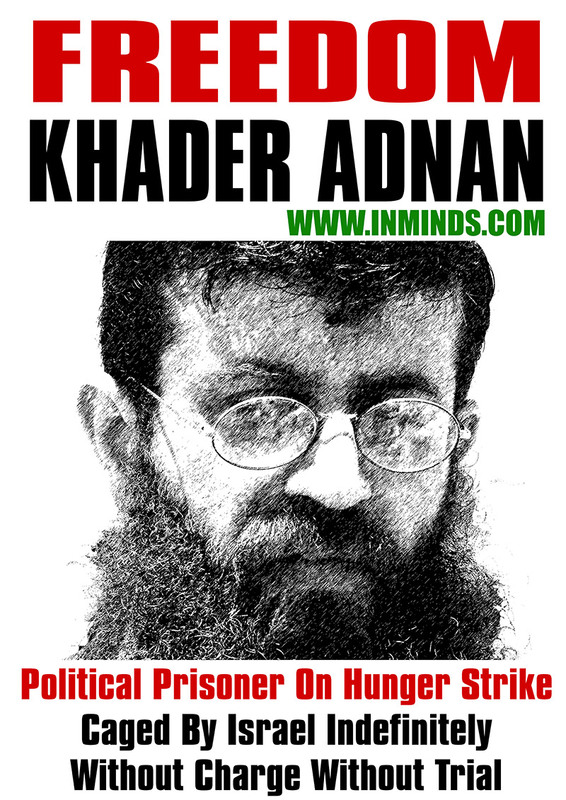 His successful 66 day hunger strike in 2012 - the longest in Palestinian history at the time, inspired over 1600 other Palestinian prisoners to hunger strike. 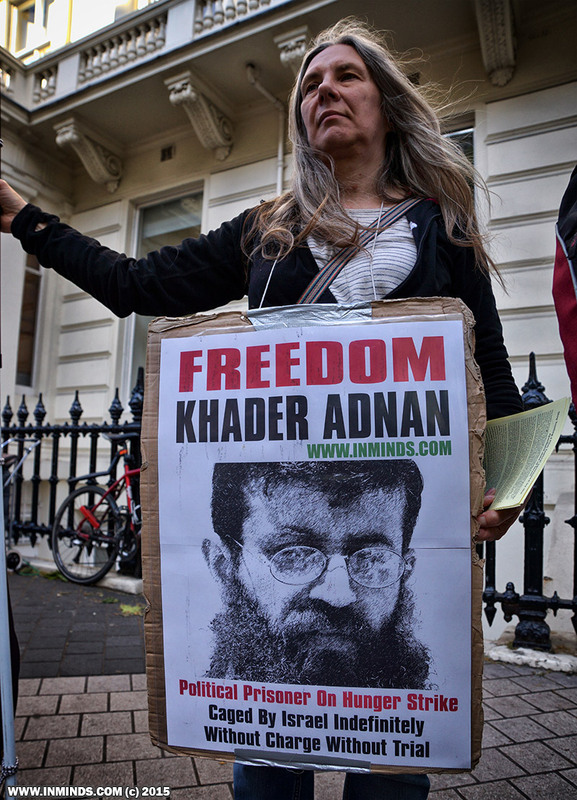 Since his release Sheikh Khader Adnan has been the voice of the Palestinian political prisoners, ceaselessly defending their rights at every opportunity and thus is a thorn in the side of the occupation. 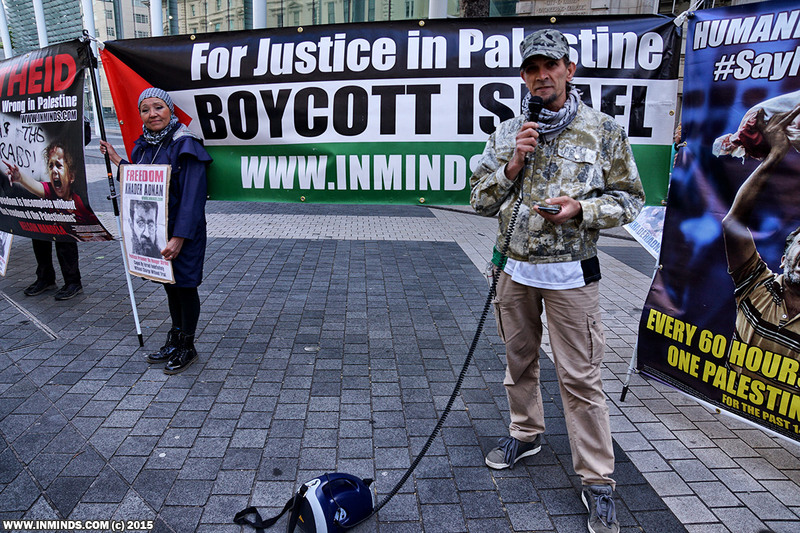 He has been in and out of occupation prisons since his student days from 1999 due to his political stance against the occupation. 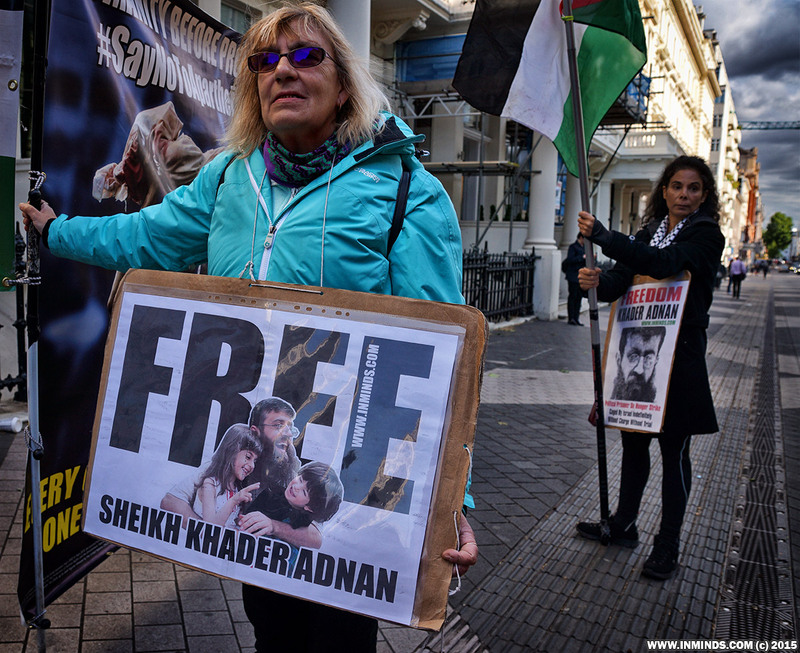 He has spent more than 6 years of his life caged in occupation dungeons, yet he has never been formally charged with anything let alone stand trial for anything. 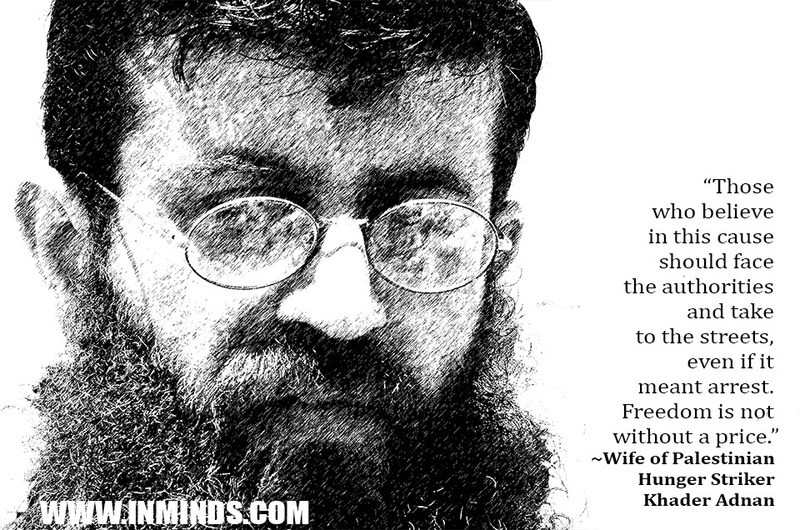 This is the english translation of the message from Sheikh Khader Adnan on day 30 of his hunger strike written at the so-called Ramla prison hospital, more accurately described by patients as a 'slaughter house' due to the treatment the patients are subjected to. 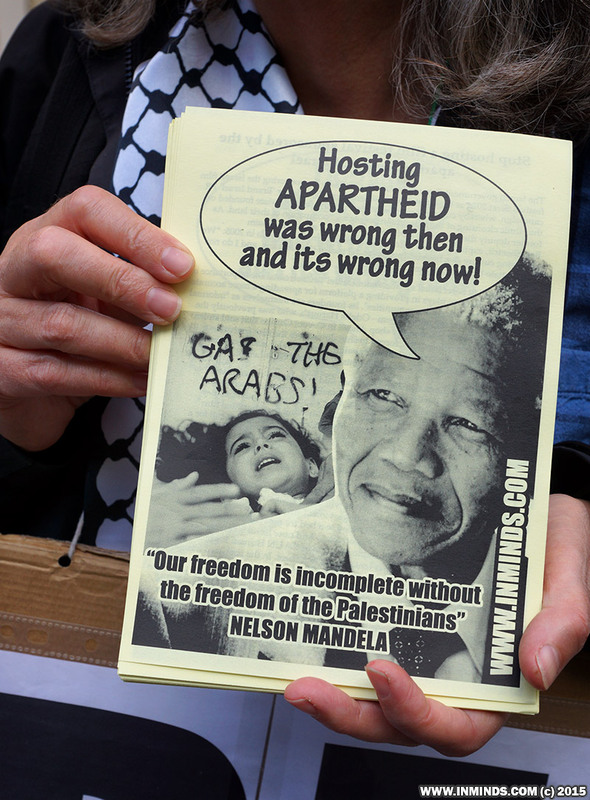 Today the German government is shamefully celebrating 50 years of collaboration with a racist apartheid regime. 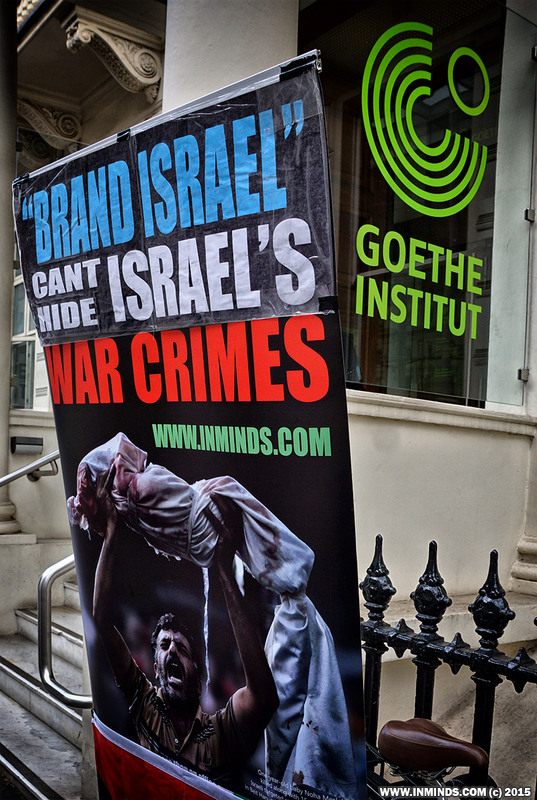 As part of this celebration of ethnic cleansing, occupation and war crimes the German deputy ambassador Tania Freiin von Uslar-Gleichen and the Israeli deputy ambassador Eitan Na'eh are hosting a reception at the Goethe Institut to launch the Israeli government sponsored Seret 2015 film festival. 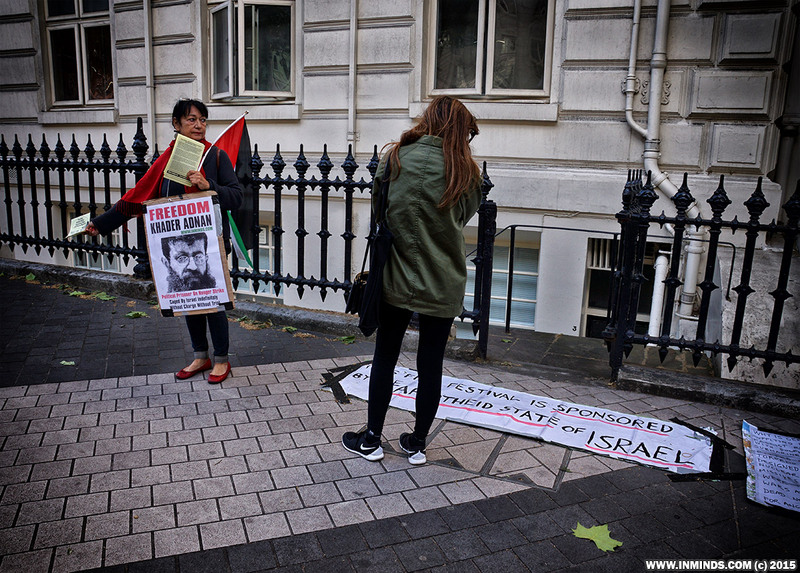 We are here outside the Goethe Institut to tell the German deputy ambassador to stop pandering to a regime whose deputy defense minister has threatened the people of Gaza with a holocaust; a regime whose siege of Gaza has been compared to the nazi siege of the Warsaw Ghetto by the United Nations Human Rights Rapporteur; a regime whose genocide in Gaza has been unequivocally condemned by more than 300 survivors of the nazi holocaust. 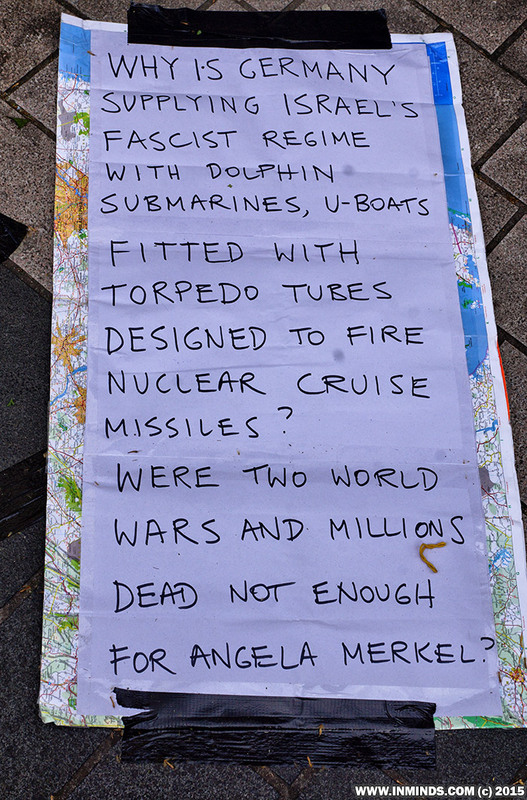 We ask the deputy ambassador to learn from Germany's past and stop supporting a fascist racist regime, to stop arming Israel with nuclear submarines, and to stop helping Israel whitewash its crimes behind a veneer of culture. 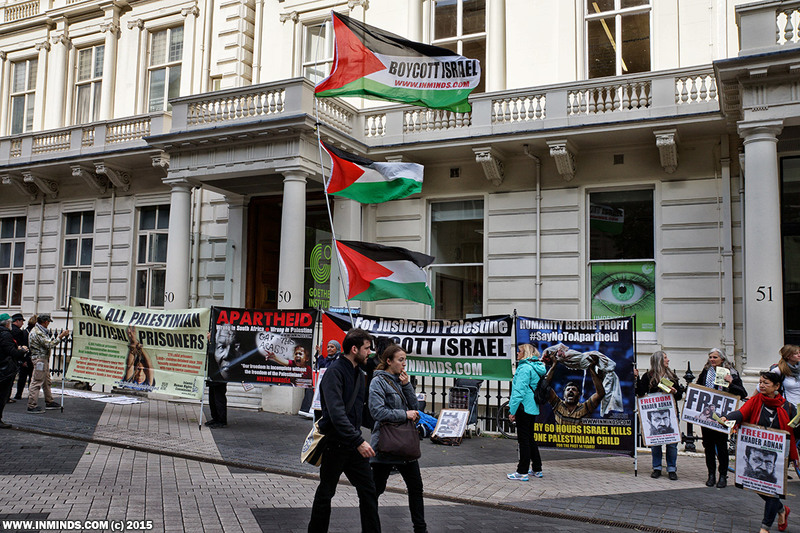 The Israeli government through its London embassy is sponsoring the Israeli film festival Seret 2015 as the latest chapter of Israel's million-dollar ‘Brand Israel’ PR campaign, whereby culture is used to whitewash an apartheid state founded on the ethnic cleansing of the Palestinian people and occupation of their land. 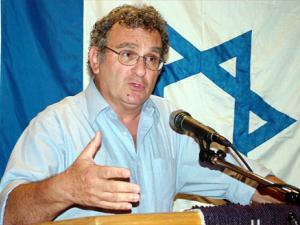 As former deputy director general of the Israeli foreign ministry, Nissim Ben-Sheetrit, explained upon launching the Brand Israel campaign in 2005: “We are seeing culture as a hasbara [propaganda] tool of the first rank, and I do not differentiate between hasbara and culture.”. 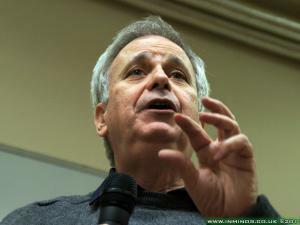 At last years launch of Seret Israel's ambassador Daniel Taub stressed the importance of "the role the Festival plays in providing a platform for spreading a more accurate picture of Israel across all communities". 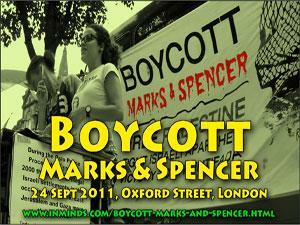 Its founders see themselves as "informal ambassadors for Israel", one of them - Odelia Haroush, who was previously the marketing manager of the settler shop Ahava in Covent Garden that sold stolen dead sea produce before being forced to shut down, sees the film festival as a direct response to the boycott Israel campaign. 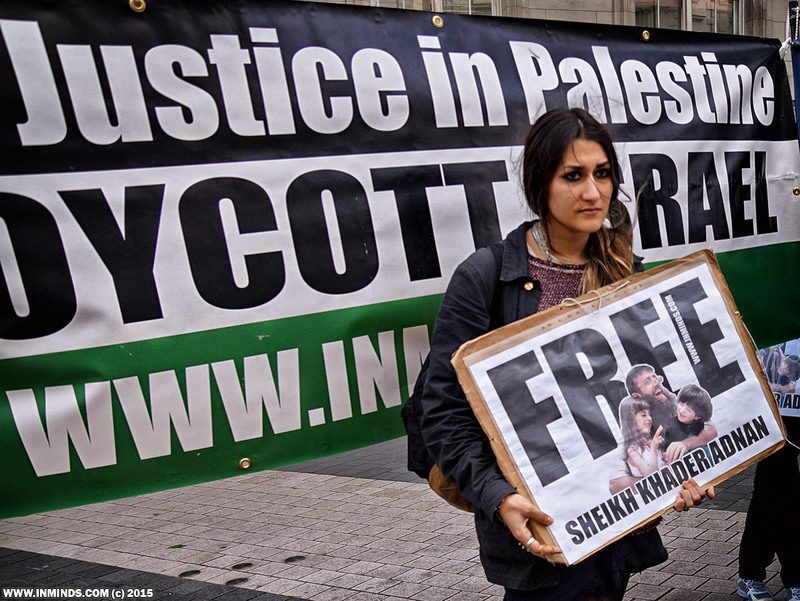 The festival is also co-sponsored by occupation profiteers like Bank Leumi. 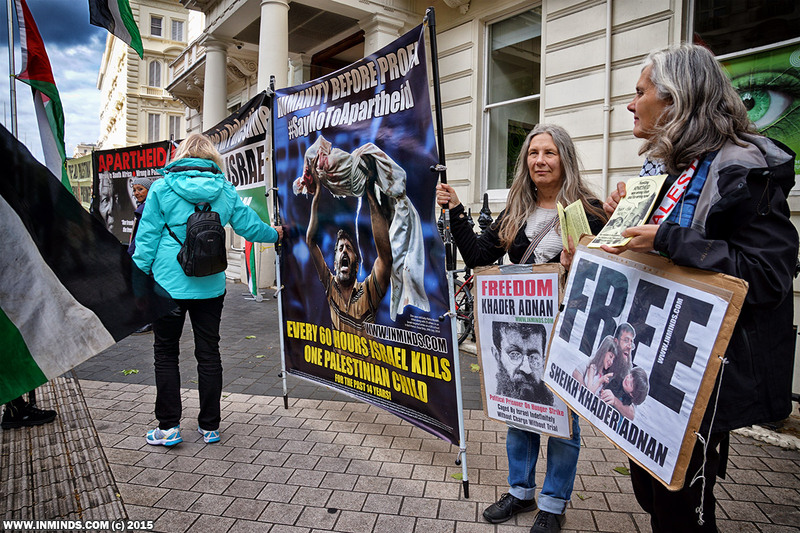 Acclaimed British filmmaker Ken Loach has said "The massacres and state terrorism in Gaza make the showcasing of Israeli films in various sections of international film festivals unacceptable". 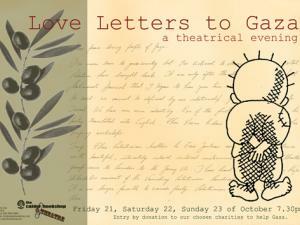 After public outcry small independent cinemas have stopped hosting this apartheid film festival. 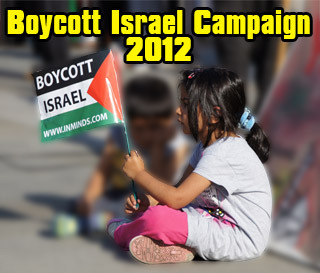 We urge this years hosts to similarly abide by the Palestinian call for a cultural boycott of Israel. 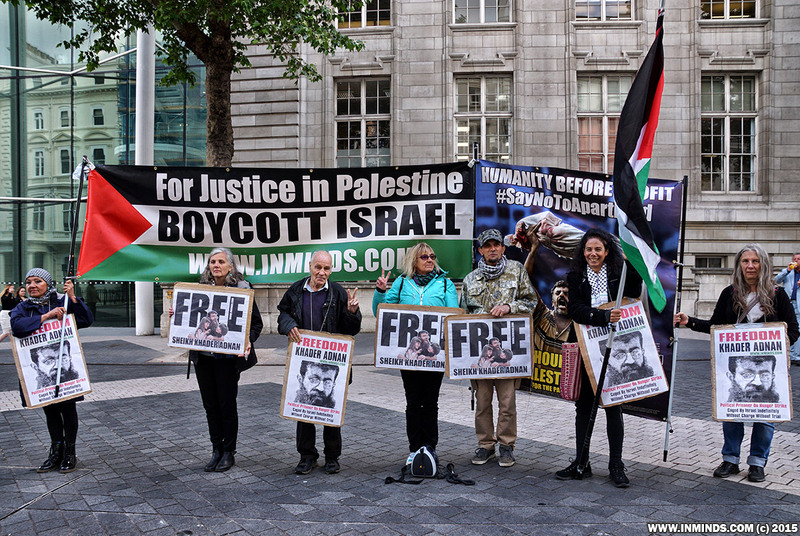 We welcome independent film making but reject the promotion of Israel in the UK while Palestinians continue to live under siege, discrimination and exclusion. 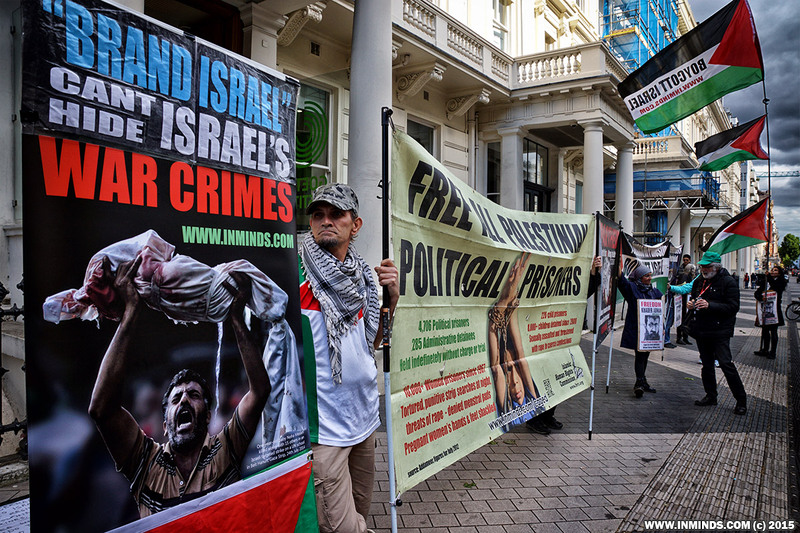 Goethe Institut Stop your complicity with apartheid, it was wrong in South Africa and its wrong today in Palestine. 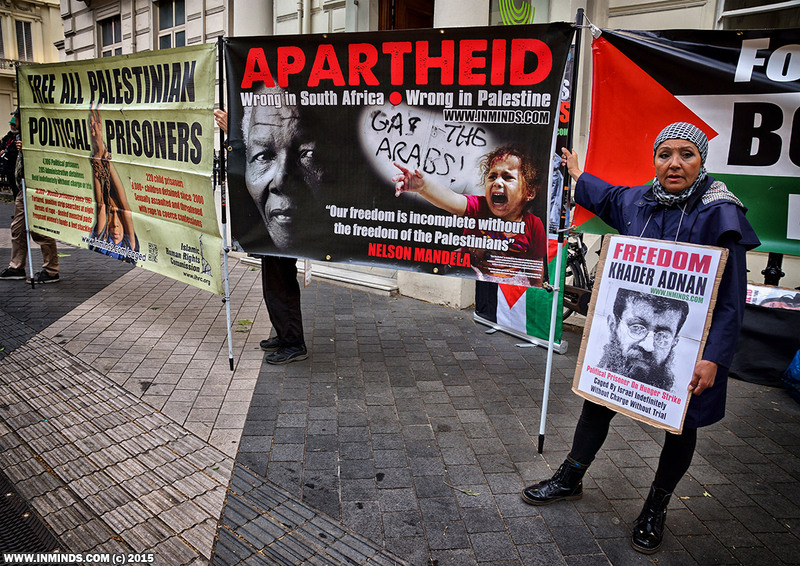 Stop hosting apartheid, stand on the right side of history! 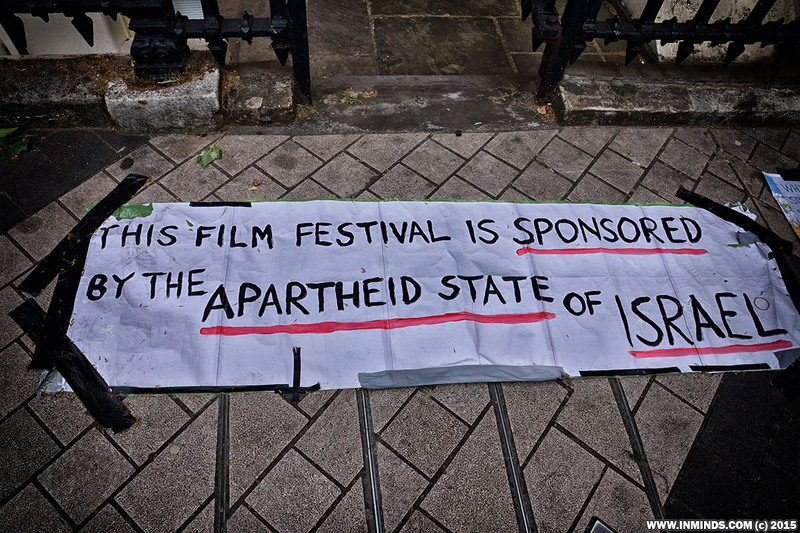 The festival is co-sponsored by the Israeli government via the Israeli embassy in London, creating a direct link between these cinemas, the festival screenings and Israeli policies. 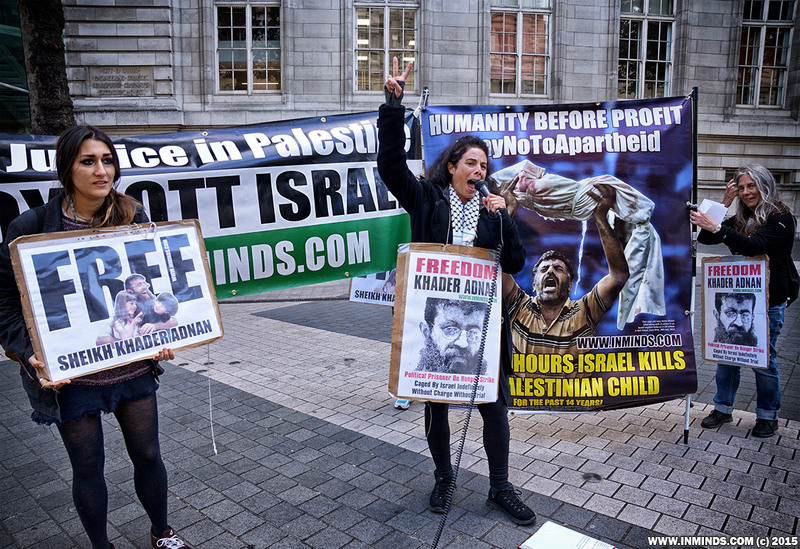 By benefiting from money from the Israeli state, the cinemas become silent accomplices to the violence inflicted on the Palestinian people. 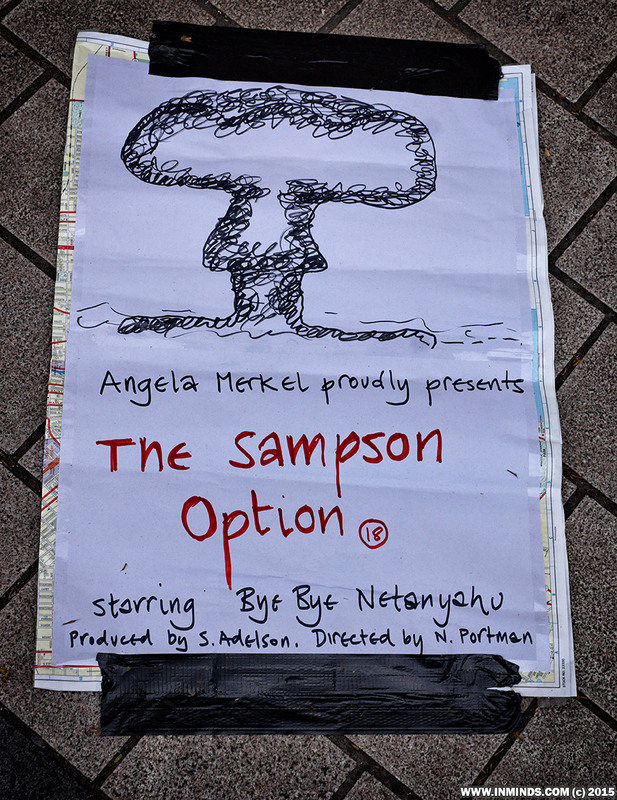 Such collaboration and cooperation is unacceptable. 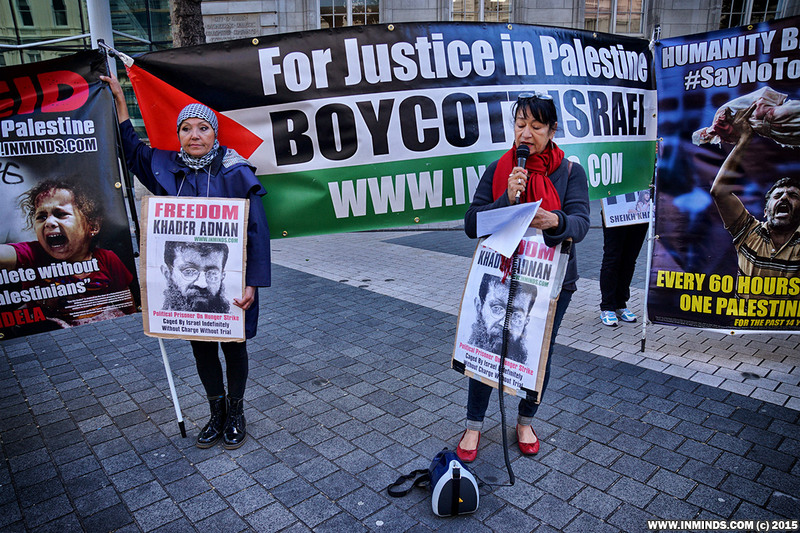 It normalises, even if unintentionally, the Israeli government’s violent, systematic and illegal oppression of the Palestinians. 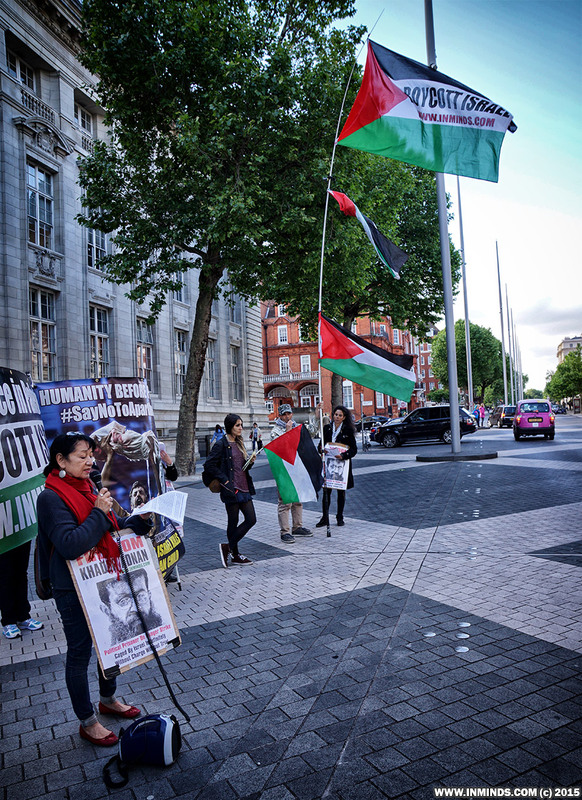 At the protest we also remembered Muhammed Abu Khdeir the 16 yrs old Palestinian schoolboy burnt to death by Israeli settlers last July (2 July 2014).